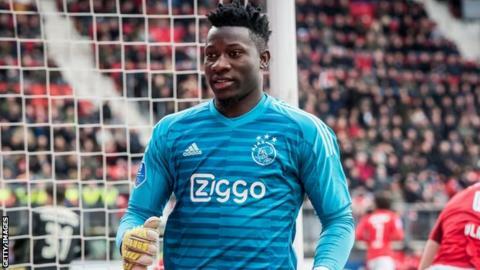 Cameroon goalkeeper Andre Onana has signed a one year extension with Ajax Amsterdam which will keep him there until June 2022, according to the Dutch club. Onana made his first team debut for the four-time European champions on 20 August 2016 against Willem II. Since Clarence Seedorf's appointment as Cameroon's head coach in August 2018, Onana has become his country's first choice keeper and played a pivotal role in helping the Indomitable Lions qualify for this year's Africa cup of Nations in Egypt. Onana joined Ajax in 2015 from Barcelona, having found his way to the famous La Masia academy through a link with the Samuel Eto'o football foundation in Cameroon.